I may be able to acquire a new colony with hive soon, from a beekeeper who want’s to reduce his number of colonies. I’m not sure yet on the details on this colony or if I actually will be able to get it but I hope I will, certainly now I’m slight unsure on the survival of my remaining colony. I would have liked to begin the season with two colonies, which I would have done if both my colonies had survived, but having at least one colony of bees is I’d say a prerequisite for being able to call yourself a beekeeper. When you have more than one colony you can supplement one colony with a possible excess in the other, either with stores or brood or a queen(cell). That is, if my last remaining colony/queen is still viable. Which I hope to find out on tomorrow when the temperature is predicted to exceed 18 degrees (64 F). There is also a little voice in the back of my mind saying that it would be a bad idea to hand me another colony, seeing how the last one and perhaps the last two fared. I guess I’m going to ignore that voice and if the chance presents itself I will gladly take on a new colony. I would like to have about 5 colonies in total, in a few years. I suppose that way my beekeeping life will be a much more relaxed one. Loosing one colony would be regrettable but not catastrophic. When you have “x” chance on losing each colony you are expected to loose a percentage of your colonies over winter. Say each colony has a 20% chance (made that up on the spot) not to survive winter. If you then have 5 colonies you will expect to loos one colony over winter. This is a bummer but an expected risk of being a beekeeper, it comes with the territory. But losing a percentage of your colonies when you only have two, can easily mean you lose all your colonies and in a sense you will have to start over. If you have also paid money to acquire a carnica or buckfast queen then losing that colony also means loosing an investment. Now for me that isn’t the case as of yet, although I do plan on becoming either a buckfast or carnica beekeeper in the future and maybe even try my hand at queen rearing. For now I’ll just concentrate on the colony in the apiary. Edit: I went to the apiary today. Beautiful weather, warm and sunny although there was a lot of wind. I went mainly to find brood and eggs. I checked all the frames this time and I found caped brood, larva swimming in their food and eggs. There wasn’t all that much brood in my opinion. But perhaps that is just my inexperience and this amount of brood is normal for the time of year. If I had to guess I’d say there was perhaps a little over one side of a frame of brood divided over three frames. The frames also containing stores, fresh pollen and either sugar syrup or honey. I also found the queen (see image to the right). This is the first time I have seen this queen because she was reared late last year. I thought she looked slightly small, compared to the other queens I’ve seen. Perhaps that is the reason she doesn’t give as much brood. I’m just speculating here. Time will tell as I can’t replace her before the swarming season in June. I am also not that experienced, but it sounds like your queen is fine. I know they start with a small amount of brood and build from there. They have to have enough bees to cover the brood in the event of a cold spell. I also don’t think there is as much math to colony loss, however it stands to reason that the more colonies you have the more should overwinter. I do know beekeepers that from time to time loose all of their colonies for whatever reason. Yes, later I had a similar thought, there will not be enough bees to take care for all that much brood, the possibility for colder weather (the forecast is about 10 degrees Celsius for the coming week or more) is indeed still there. 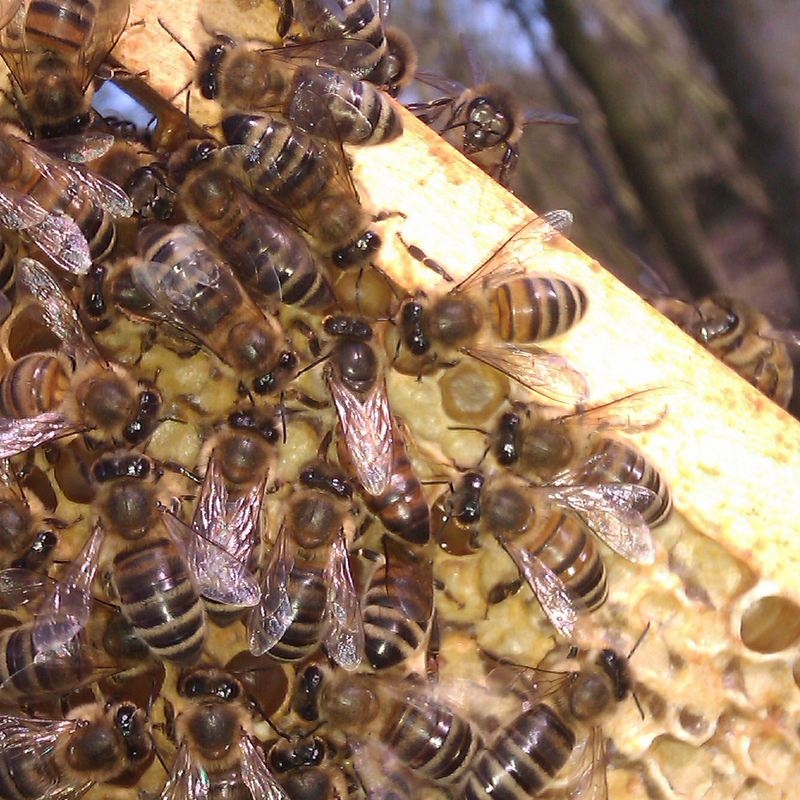 Hopefully the more bees emerge from the comb the brood the queen will produce. I don’t use math to predict the survival of my bees, it was just a tool to make a point.